The Great Lakes Towing Company’s newest tug, CLEVELAND was issued its United States Coast Guard (USCG) Certificate of Inspection (COI) under Subchapter M.
As of July 20, 2018, all towing vessels nationwide are required to comply with the provisions of the new 46 CFR Subchapter M. There is an initial phase in period for compliance and eventual issuances of the COIs. The Towing Company has been working with the USCG during the on boarding process and now scheduling inspections for the entire towing fleet. 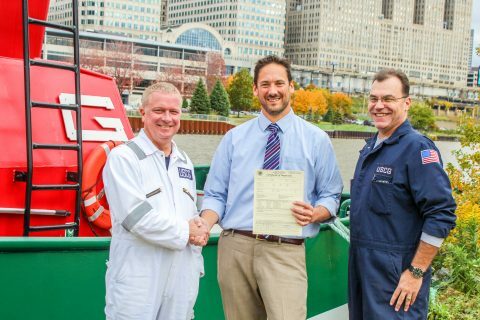 “We’re excited to be at the forefront of our industries’ efforts to implement the new safety requirements of Subchapter M. From beginning to end, our own effort to meet obtain the Certificate of Inspection was a partnership with the American Bureau of Shipping and Coast Guard Marine Safety Unit in Cleveland. We look forward to working in partnership with these organization as we continue to certify our tugs,” comments Lindsay Dew, Director of Operations, The Great Lakes Towing Company.